In the world of cinematic movies, the year of 2014 saw a lot of big hits, which includes Dawn of the Planet of the Apes, The Hobbit: The Battle of the Five Armies, Captain America: The Winter Soldier, and Guardians of the Galaxy. In amidst these box office juggernauts, was a film that no one expected to be a surprise hit……John Wick. Yes, the action-based film that starred actor Keanu Reeves was a smash hit, finding Reeves (as the title character of John Wick) becoming a one-man army against the Russian mob for stealing his car and killing his dog. While John Wick didn’t reach a six-figure box office number (like those I mentioned above), the movie make roughly $ 86 million worldwide. This may not sound like a lot, but, given its production budget was only $ 20 million, the film made back its money and tripled it. In addition, the movie was critically praise by fans who relished the non-stop action thrills that movie provided. Now, after three years, Summit Entertainment, director Chad Stahelski, and actor Keanu Reeves present the next installment of John Wick’s adventure with John Wick: Chapter 2. Does this second helping of Mr. Wick deliver or is its barrage of action nuances too much for moviegoers to enjoy? After typing up lose his end with the Russian mafia (retrieving his stolen car from the last film), John Wick (Keanu Reeves) returns home with his pet dog, hoping to reenter his retirement away from his ruthless and violent past of being a cold-blooded mercenary. His silence in retirement is, however, broken when Santino D’Antonio (Riccardo Scamarcio), an underworld kingpin figure who calls in his blood oath marker to John, forcing Mr. Wick to organize the murder of Santino’s sister Gianna (Claudia Gerini), which will allow Santino her place the “High Table”, a secret league of crime families. Reluctantly, John is called back into duty, traveling to Rome to set up shop, arming himself with the latest in weaponry and “fashionable” body armor and waits for the perfect time to strike. Unfortunately, Santino double crosses John as he’s soon on the run, with the villain offering a substantial contract bounty for his death. With enemies all around and unsure where to turn, John instead goes to war, facing vast array of mercenary assassins out to claim the fortune bounty of Mr. Wick’s head, following his instincts as increasingly hostile challengers come to collect, making his survival difficult for the famous “boogeyman”. If I’m being quite honest with you guys, I didn’t see John Wick until a day before seeing John Wick: Chapter 2. (I know…shocking). Back in 2014, I remember people talking about John Wick and how good it was and it was great action flick, and so on and so forth. However, I didn’t pay much attention to it and sort of put “out of sight, out of mind”. While taking my many trips to my local movie theater, I kept on seeing the trailers for the John Wick: Chapter 2 and (from the trailers) it looked pretty interesting in an action popcorn type movie. So, the night before Chapter 2 was released (on its opening night) I watched John Wick via On-Demand. Personally, I liked it. Of course, I didn’t like it when Wick’s dog was killed (spoiler warning to anyone has seeing it yet), but it was pretty insane to see Reeve’s Wick take on a whole Russian mafia family by myself, with some crazy action scenes and shootouts. With the knowledge of the first film fresh in my mind, I went into Chapter 2 and kind knew what I was going to get. So…did I like the movie or not? Don’t worry, I did like it. In truth, John Wick: Chapter 2 serves up what finds want to see (i.e. plenty of action), while also explore more of the mythos within underworld of assassins, making the film highly enjoyable. Returning to the director’s chair is Chad Stahelski, who previously co-directed the first John Wick movie with David Leitch. With Stahelski at the helm again (flying solo this go around), Stahelski is just as important to Chapter 2, with his extensive knowledge of the John Wick universe as well as his background in movie stunts (now a stunts coordinator) in such action oriented films such as V for Vendetta, The Expendables 2, 300, and The Matrix. With that background, Stahelski is a prime candidate for making Chapter 2, in which he exceeds in bring non-stop action thrills throughout the entire feature. Interestingly, the movie is more self-aware of its premise, finding Chapter 2 more over-the-top than the previous film, but in a good way, something fans of the first John Wick would like. Yes, there dramatic parts to the narrative, but the film (as a whole) is playful in its direction and aware of its presentation, which makes the film that much more entertaining. And yes, the action movie is awesome (the film is rated R), with plenty of great scenes that will please many action film enthusiasts out there. Thankfully, while most action oriented feature would utilize the whole “shaky cam” effect with quick cut edits, Stahelski keeps Chapter 2 mostly away from that and more focus on the bombardment of action that’s playing out in that particular scene. This is most notable in the film’s opening sequence, which sort of helps bridge the events of the first film to Chapter 2 as we see John Wick dealing with Russian Mob. Its great opening action salvo that grabs your attention and prepares for what’s ahead in the movie. In truth, the movie itself feels “bigger”, seeing Wick traveling beyond the setting of New York to a more international location (i.e. Rome). In addition, the set designs are more elaborate and expansive, which makes the whole scope of the movie broader and (perhaps) grander. Another way where Stahelski excels is having Chapter 2 expand on the idea of mercenary assassins and their hidden worldly order. This, of course, helps flesh out all the lore behind John Wick’s past life (i.e. the movie hints at the John’s “impossible” task) and the mythos behind Winston’s underground organization of hired assassins. While I did love Chapter 2, I do have some minor nitpicks about the movie. First off, while I did mention that the movie is self-aware of its over-the-top angst, it does come a bit off-putting (at some points) to see John Wick facing off some many characters (at one time) and comes up on the top. At that point, the movie starts to feel bit like a video game, as if John Wick feels like a COD (Call of Duty) game, with a player (Wick) entering a map of heavy fortified area of mindless non-cpu combatants (all the bad guys). Even the third act (the scene where there in the glass mirror rooms, sort of feels like a video game level (if you think about it). Next is more of a “what if” scenario. I’m sure fans of the first John Wick are going to like Chapter 2 (and they should). However, the praise and success of Chapter 2 will most likely open the door for future installments (Chapter 2 hints at a continuation at the end). While I’ll be excited to see where Chapter 3 goes, I’m concerned that Hollywood will take the idea of John Wick and run it into the ground. Studios execs have done this to many movie franchise and have gotten out of hand with them, making each sequential installment a mediocre version of the last one until fans don’t really care about the franchise anymore. So, if the studio plan to create John Wick: Chapter 5, 6, and 7, then either the character (John Wick) evolve or the story has to. I know that’s a “what if” scenario, but it would be terrible if the studio ruined the John Wick franchise with mediocre run-of-the-mill scenarios. Again, these are just minor negative quibbles that I have to point out. Much like the first film, Chapter 2 is primarily about the character of John Wick as actor Keanu Reeves returns to reprise the role of the deadly mercenary assassin. Reeves, mostly known for playing the lead character of Neo in The Matrix trilogy, is fully committed to the role of John Wick, seeing the now 52-yeard old actor connivingly selling the character in what he says or does. While he isn’t the most “theatrical talented” actor in Hollywood, Reeves is able to blend the overall toughness and one-liner levities into a role, imbuing John Wick with a great balance of action and some slightly humor, which makes for a great lead action star. Like Max Rotansky from the Mad Max movies, the character of John Wick is a man of few words, letting his deadly ferocity and lethal assassin-like training do most of the talking. Thankfully, Stahelski keeps the first film iteration of John Wick intact in Chapter 2, keeping character dialogue scenes to a minimal and devoting more time to his action sequences. These supporting characters in Chapter 2 aren’t quite developed. However, that’s not necessarily a bad thing as Chapter 2 is rather focused on its relentless action scenes rather than deeper insight into some of its side characters. A prime example of this is found in Rapper / actor Common and actress Ruby Rose appear in Chapter 2 as Cassian and Ares, two of John rival hitmen trying to track him down. Both handle their action scenes well, but neither really leaves a mark on their character and are the classical “henchmen” that’s atypical to the action genre. On the other hand, Rose’s Ares is bit more memorable than Common’s Cassian, making her character communicate only via sign language, which does make Ares visually interesting (plus its Ruby Rose…. she already “visually” interesting…. if you know what I mean). The same goes for the film’s antagonist Santino D’Antonio, who is played by Riccardo Scamarcio. Again, there isn’t much to the character other than being the crime kingpin baddie that John Wick must take down, but Scamarcio plays the part well, making him suitable as the film’s villain. Perhaps the only “new” supporting character that makes a really impact is from Laurence Fishburne’s character The Bowery King, a ruthless crime lord in New York City. Fishburne’s role is a very minor one, but you can tell that he’s having fun in the part and makes the most of the role. 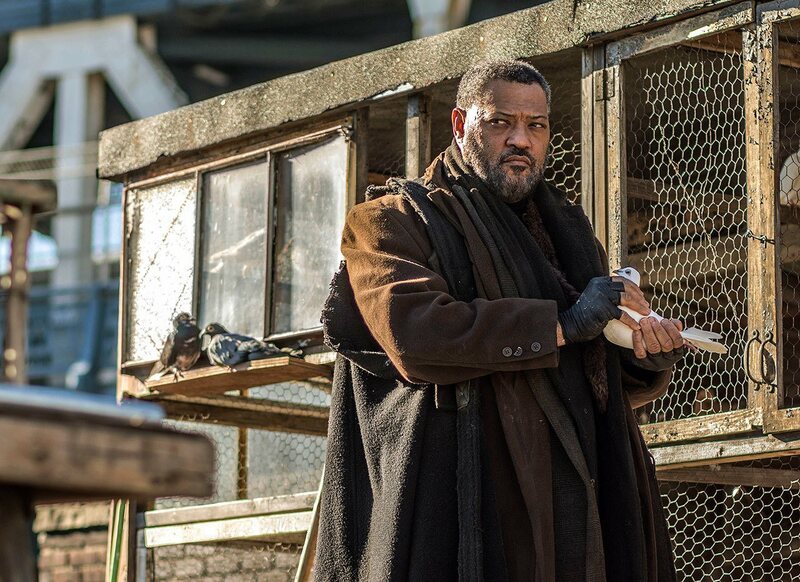 As a side-note, it’s kind of cool to see both Reeves and Fishburne (or rather Neo and Morpheus from The Matric trilogy) reunite together again. So, while these characters are merely there for either screen presence, obstacles for Wick to face, or stock-like characters in the action genre, it still works for “the greater good” of the Chapter 2, working in its favor rather than against it. Lastly, in the category of supporting characters, Chapter 2 sees the return of familiar side characters from the first film. Reprising their roles again is Ian McShane as the “manager” of the Continental Hotel in New York, Winston (McShane lends his acting gravitas in this role and does standout more than he did in the first film), John Leguizamo as the chop shop owner, Aurelio, Thomas Sadoski as Jimmy (a police officer and friend of John), and Lance Riddick as the concierge at the Continental in New York, Charon. Much like the first one, these characters aren’t fully development characters, but they add continuity between the first film and Chapter 2 (for audience members) and the actors who play them are good, giving their respective characters (no matter how small a part) enough time to be memorable in the grand scheme of the movie. The boogeyman comes out of retirement for another hair-raising adventure of action, double crosses, and crazy shootouts in the movie John Wick: Chapter 2. Director Chad Stahelski’s newest film brings all the “pomp and circumstance” from the first film and doubles down on all the insane barrage of action nuances and high octane thrills. While it may not be totally perfect, with some minor quibbles here and there, the movie still retains its fundamental core of values over-the-top action and breathtaking shootouts. Personally, I liked it. It wasn’t the most sophisticated action thriller movie out there, but the John Wick movies aren’t designed that way (and they shouldn’t be). Plus, it helped that Chapter 2 was more self-aware of its ridiculous dramatic action setup, which creates a more entertaining popcorn feature for its viewers. Thus, I would give this movie an approval rating of highly recommended from me. If you were a fan of the first film (or an action movie junkie), then John Wick: Chapter 2 is definitely worth checking out. My advice…. accept the contract, take the marker, check yourself into the Continental Hotel and go see John Wick: Chapter 2. Its pure action escapism at its best. Haha…thanks. Kind of wished there was more of her or more to her character. Thanks for reading and for the comment. Yeah, we need a break from those types of movies. Chapter 2 is a great action movie that deserves its praise. This is actually the action movie I am looking forward to watching. I love how it all looks visually. Great review. Hey, there. Thanks for reading and for the comment. It was a really good movie. Personally, I liked it more than the first one. Heard they planned on making it a trilogy. So, basically, this franchise should pretty much end after the next film. That also means it will be the second trilogy Reeves has been in. I want either Trinity or Agent Smith in the 3rd one! Preferably both! If there’s making it into a trilogy, then great. I like that idea. I just don’t want this franchise go downhill with run-of-the-mill sequels. Hollywood is notorious doing that. I just don’t want to see John Wick: Chapter 10 (the Return of Wick’s Son). Thanks for reading and for the comment. I share your concerns about the next installment. If they can’t do something to further develop John Wick’s character, better let it end here. But I still wish for Chapter 3 – I want to know how he handles that impossible situation. It’s like in The Matrix – so many Agent Smiths to eliminate! Thanks for the comment. Yeah, I’m still looking forward towards Chapter 3, but I just have hope they don’t ruin a already good thing with John Wick. I loved Chapter 2, so I just don’t want the next installment (or future installments) too be watered down version of the previous two. I liked this movie. Not as great as the first, but still a pretty good flick. Thanks for the comment. Yeah, the movie wasn’t as emotional or drama heavily than the first one, but Chapter 2 did have plenty of action and was a bit self-aware of that. John Wick’s action are exactly like a video game, but Reeves kind of makes it work. Don’t like what happened to the dog in the first movie though. As for Common as a side character, is there nobody else? I love Common, but Hollywood, you mean to tell me there’s nobody else as cool as Common? Thanks for this review Jason. I enjoyed reading it a lot.